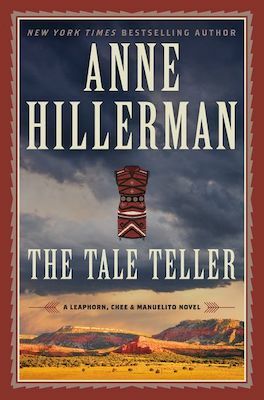 The following is an exclusive excerpt from The Tale Teller, the fifth in Anne Hillerman’s Leaphorn, Chee & Manuelito series. Navajo policeman Joe Leophorn investigates a missing Navajo artifact, but when the primary suspect dies and anonymous letters warn him of witchcraft, Joe and the Tribal Police suddenly find themselves in a turf war with the FBI. For the past twenty minutes, Joe Leaphorn, former Navajo police lieutenant turned private investigator when the job suited him, had focused on not losing his temper. He should have stayed retired. Maybe bought a camping trailer and traveled around, taken up bridge, given golf another chance. And it was all Louisa’s fault. 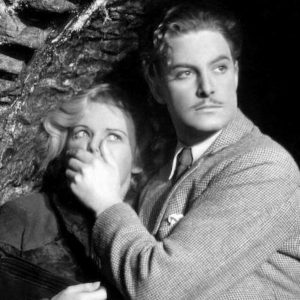 Over the years, he’d learned that Louisa could be as tenacious as a badger. It simplified his life to go along with her ideas when they were reasonable, which they usually were. So when he went to the tribal library to return the borrowed books, he made sure he brought his little notebook in case whatever Mrs. Daisy Pinto wanted to talk to him about actually led to a case worth investigating. As of now, he had spent half an hour with her standing in the large lobby between the museum and the library. For most of that time, Mrs. Pinto had been dealing with the public and hadn’t made the opportunity to discuss his potential assignment. Mrs. Pinto represented the Navajo Nation with respect and courtesy to these people who didn’t seem to realize they were intruding on the start of a business meeting. Leaphorn’s irritation rose as the string of distractions continued. Each interruption made him grouchier. While she was explaining to a family of sunburned tourists how to get to Tsegi Canyon and the sandstone cliff dwelling villages of Betatakin, Keet Seel, and Inscription House, he sat down, opened the envelope, saw that it contained a long, singled-spaced typed letter. He put on his glasses and glanced at it, then stored the thing in his sport coat pocket. Time to go home. As soon as he had ten seconds of her attention, he would tell Mrs. Pinto that if he decided he wanted to help, she needed to schedule a meeting at a time when she could focus on him. “We have a guard who is an EMT. I’ll get him.” Mrs. Pinto rushed off. The young man hurried back outside, and Leaphorn followed toward the door into the July heat. A few youngsters standing in a circle around the body parted for them. The Navajo woman was young by Leaphorn’s standards, thirty-something. He leaned over her supine body. Her eyes were closed, but he could see her chest rise and fall underneath her striped blouse. Her russet skin shone with sweat, her mouth slack. She was thin. She didn’t smell of beer, and he didn’t see any bleeding or obvious physical damage. He spoke to her. “Ma’am? Ma’am? Help is coming.” Her eyelids fluttered but stayed closed. A blue cord, a lanyard like those people use for ID cards, hung loosely against her neck. The end, where there might be identification, had slipped beneath her body. Her eyes were closed, but he could see her chest rise and fall underneath her striped blouse. Her russet skin shone with sweat, her mouth slack. Leaphorn straightened up and growled at teens who were closest in the language he spoke best, Diné Bizaad. “Give this woman some privacy.” They might not have understood the Navajo words, but they got the message and backed away. The woman’s eyes opened, but she couldn’t seem to focus. It took her several seconds to respond. “I don’t know what happened. I just felt so weak and my head hurts.” She gasped for breath. “I’m not sure. She lost consciousnesses, but when I left she opened her eyes and said a few words.” Leaphorn spoke in Navajo. He climbed into his truck, started the vehicle, and heard a grinding sound. It happened every once in a while, reminding him that when he could afford it, he should have it checked. Whatever it was, it was probably expensive to fix. “Just tell them Leaphorn stopped by to give them grief.” He spoke in Navajo. “No, sir. He worked for the BIA. He served . . .” Her phone rang. She looked embarrassed. As he left the building, he wondered about himself. Until a few years ago, his dealings with most civilians tended to be strictly business. Was he becoming one of those garrulous old-timers whom people dreaded encountering? He walked out to the parking lot, noticing the breeze that had come up against his skin. He found a piece of paper stuck beneath his windshield wiper, probably an advertisement of some kind. He lifted the wiper blade to free the paper so he could dispose of it. If it was an ad, it was clever: just a simple white sheet folded in half with the message on the inside. Mrs. Pinto is not who she seems. Be careful around her. He read it again. He didn’t like the idea that someone was watching him, following him, and that the unknown observer obviously wanted to scare him. He put the paper in his coat pocket, next to Mrs. Pinto’s letter, with a sense of unease. He drove home, parked by the back door as usual, and entered through the kitchen. Giddi came from wherever the cat had been sleeping to investigate the intrusion. Louisa considered the cat— she called it Kitty—to be her pet, but now that it was just the two of them, he spoke to it in Navajo. The cat pranced away, tail in the air. He realized that he had turned off his cell phone for the conversation with Mrs. Pinto. Even though he was well enough to drive again, Louisa worried if he was out longer than she’d expected. He turned it on to call her and discovered two messages—none from her. The first was Mrs. Pinto informing him that the information person had called in sick. She’d have to mind the desk until the replacement showed up, she said, but he should come anyway. He erased it, wishing he had listened sooner and saved himself a frustrating morning. The second was from Jake, a therapist he had been working with to improve his spoken English. He fast-forwarded to the end and deleted it. He sat at the kitchen table and opened the envelope from Mrs. Pinto. It contained three pieces of white paper, a typed letter, and two copies of a contract. He read the letter first. Thank you for considering this case. As the director of the Navajo Nation Museum, I have two problems I would like your help in solving. The museum recently received an anonymous box with some donations. The reason I am requesting your assistance is that the most valuable item on the list that came with the donations either was not included or has disappeared. Because of the sensitive nature of this problem, I prefer not to tell you any more until you have agreed to offer your assistance as a consultant investigator. If you will help, I have copies of the paperwork we received with the donation shipment. Before we contacted you, my assistant worked to track down the sender without success. 1. Find out if the missing item was in fact included the shipment. 2. If it was not included, we would very much like to obtain it, which involves making contact with this secret donor. 3. My assistant has also called to my attention that the donor’s inventory listed a bracelet, necklace, and earring set. Only the necklace and earrings seem to have been included. If you could track down the bracelet, your help will be appreciated, but it is not as important as the first missing piece. To do this, you will need to find the anonymous donor. The letter went on to detail Leaphorn’s reimbursement for time and expenses and the fact that Mrs. Pinto needed the matter resolved before she started her retirement next month. He was thankful that the brain injury had not affected his comprehension of English. Leaphorn put the letter down, glanced at the enclosed contract, and stood. He had left about a cup of coffee in the pot from that morning. He lifted his mug off the drain rack, poured in the cold liquid, and placed it in the microwave. Louisa said reheated coffee smelled like burning leaves. He didn’t mind it, and he had learned long ago not to waste anything. He pondered Mrs. Pinto’s request as he waited for the coffee to warm. What could the missing item be? Perhaps something associated with a ceremony, he thought, something that the collector shouldn’t have had in the first place. The fact that the items arrived anonymously also raised the question of their legitimacy. Had they been removed illegally from Indian land? Perhaps they were fakes, or the contents of the box were all stolen merchandise. He hadn’t heard the cat return to the kitchen, but he noticed it looking up at him now, joining him to wait for the ding that indicated the little oven had done its work. Mrs. Pinto, he thought, had some shrewdness to her. She’d given him just enough information to prompt him to call and set up an appointment to learn more. How had the box been shipped? Why was the gift a secret? If the item was as valuable as she hinted, an unscrupulous person might have been tempted to steal it. The microwave beeped, and he carried the warm cup to the table. He took a sip of coffee, put on his glasses, and read the letter again. He thought about the questions Mrs. Pinto raised and came up with three plausible possibilities: the missing items, as she stated, were never included; the items were stolen en route to the museum; or the items were removed from the shipment after it arrived. He jotted a note to ask her if she herself had opened the box. And if Mrs. Pinto hadn’t opened it, who had? The fact that the items arrived anonymously also raised the question of their legitimacy. Had they been removed illegally from Indian land? Perhaps they were fakes, or the contents of the box were all stolen merchandise. If the anonymous package had come through the mail, he had a friend who was a postal inspector who might be of help. He made another note. Leaphorn smiled to himself, realizing that he’d taken some moves toward accepting the case. Mrs. Pinto’s tactic had worked. The case seemed interesting enough to warrant his time. When he left the police department and decided to do a little freelance investigation for private clients, Leaphorn had told himself that he wouldn’t accept cases that didn’t challenge him or that required dealing with difficult people. He’d dealt with enough misfits as a cop. From what he’d seen, Mrs. Pinto was smart, organized, and demanding, but he remembered her concern for the young woman in the parking lot. He would talk to her again, this time in a focused setting, and if he thought they could work together, he’d take the case. “Too much inaruption.” Interruption, he silently scolded himself. “Maybe. Tinkin bout it.” Thinking about it, he scolded himself. Ever since he’d suffered that gunshot to the head, Leaphorn had struggled with spoken English. Louisa finished with the groceries and stood behind him, looking over his shoulder at the letter. He patted the seat next to him and she settled in. Giddi climbed up on the chair next to Louisa. The cat looked smug, he thought, as if it belonged there, too. “Bearest.” It was the first thing that came to his mind, but there was truth in it. Fear of embarrassment provided powerful motivation. Calling the donor to ask if it had been included wouldn’t be easy, which, he figured, was the reason she was asking him to do the job. “Tanks.” But he felt his insides tighten. If the world spoke Diné Bizaad, his words could fly, but English left him grounded and struggling. And she didn’t owe him anything. If there was a debt here, it was his for her hours of arranging his medical appointments, putting up with his frustration, driving him to speech therapy, and all the rest of it, running the household by herself as his health returned. He wouldn’t have healed as fast as he had without her. Lately, she was getting more mail than usual from Northern Arizona University, the institution that had supported her research. Louisa had put her profession on hold for too long. He had encouraged her to stop babying him and get back to work. He heard her footsteps as she disappeared down the hall. The phone rang. Louisa ignored it. It rang again, so he answered, expecting a woman’s voice, one of her friends. Either that or a sales call. But it wasn’t one of Louisa’s friends; it was Sergeant Jim Chee. They disposed of the pleasantries quickly, and Leaphorn waited for Chee to ask him a favor. The man surprised him. After Chee ended the call, the Lieutenant sighed. What was it about Chee that brought out the overbearing uncle in him? Why did the man still get on his nerves? He’d known him as a rookie, an enthusiastic and somewhat impulsive young man for whom doing the right thing sometimes meant bending the rules. Chee had a deep commitment to making life safer for the Diné. Although Leaphorn still considered the man a work-in-progress, he was pleased with the officer Chee had become. When Leaphorn called the museum to speak with Mrs. Pinto to set up the meeting, he learned she was out of the office at a finance hearing for the rest of the day. And, since it was Friday, wouldn’t be back until Monday. “Do you want to leave a message for her?” The receptionist sounded young and bored. From THE TALE TELLER. Used with the permission of the publisher, Harper. Copyright © 2019 by Anne Hillerman.